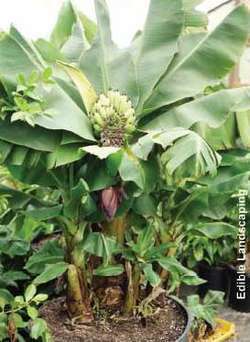 For the development of banana trees in this study, it was found that the plant height at flowering was not affected by the different soil cover systems, ranging between 209. Living in the Nantlle Valley, they shocked neighbours by growing a 15ft banana tree in their back garden. But the banana trees only sprouted green bunches of fruit this year for the first time. Cannas are in the banana family (Musaceae) and their leaves are like the big green paddles of banana trees. Today, Wurzel's backyard is a virtual jungle, filled with palm trees, staghorn ferns, bromelias, banana trees and ginger plants. There are banana trees, whispering grasses, colourful cannas, exotic colocasias, Aussie tree ferns, giant palms, cordylines and a lot of old jungle black magic. Paralleling a main highway, it crosses scraggly jungle farms, banana trees and African palms, muddy streams and the front yards of wooden shacks dotted with bony donkeys and cattle. 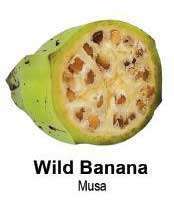 Huge fields on the plain were filled with banana trees, as were tiny fields perched on little conical volcanic hills. Kwadwo had the--to me--incredibly attractive job of being in charge of the garden of a very rich man, Mr Addae, and its white man's banana trees. There are these lovely poinsettia trees all around us and five ripe banana trees in our garden. Slowly the family descends to the new home in the valley below: "All the way up the hill under the banana trees, and across the gurgling brook, they could hear the drums beating happily ("Drums at Night"). 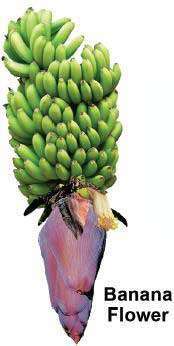 Because apple trees make apples, and banana trees make bananas," I say.